"I have always thought of my work as being celebratory. Let's say it's the three C's - commemorative, celebratory, and colorful." Best known for his iconic LOVE series, which has been reproduced in formats ranging from large public sculptures to postage stamps, Robert Indiana explores the American experience using everyday objects and language. With his hard-edge painting, bold colors, and popular imagery, he is often associated with Pop art, but Indiana rejects this label; indeed, beyond the visual lightheartedness are levels of personal and political meaning which are often dark or critical. His work integrates non-art materials, ordinary language, and commercially-inspired graphic designs with more traditional elements of fine art, elevating the viewer's daily experience and folding it into a history of art and American identity. An admirer of early-20th-century American modernism, Indiana reflected on the questions of national identity posed by artists such as Marsden Hartley, Charles Demuth, and Edward Hopper; in particular, he builds upon their use of the familiar, the ordinary, or the industrial, to transform popular sources into fine art. The American dream is often cast as an elusive and somewhat tragic quest, filled with eye-catching slogans and advertising graphics. Common language appears throughout Indiana's work, which is often layered with coded meanings, coming from Indiana's biography or classical and literary sources. These texts closely resemble advertisements; yet while they act like ads or billboards, they often subtly critique popular culture and consumerism. Deceptively simple, Indiana's ordinary images and commercial style appear similar to Pop art, yet his work is layered with references from art history and a deeply personal iconography that complicates their generic execution. Overtly political and socially engaged, Indiana interrogated consumerism and mass culture, explicitly criticizing ideals treated more ambiguously by most Pop artists. 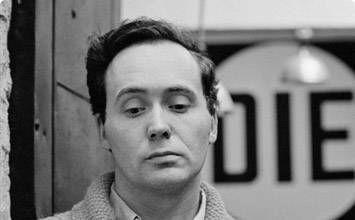 Robert Indiana was adopted as an infant by Earl Clark and Carmen Watters Clark and named Robert Earl Clark. He grew up in a financially unstable environment, as his father held a wide range of jobs, from an oil executive to pumping gas. When Indiana was nine, his parents divorced and his mother went to work; her time as a diner waitress would be influential to Indiana's artistic career. A free spirit, his mother frequently moved; by age seventeen, Indiana had lived in twenty-one different locations. Hole (1960) is a free-standing sculpture composed of a wooden rectangular column measuring almost four feet tall; near the base protrudes a wooden rod, while iron wheels are attached on both the right and left face of the column, at the same height. Two arrows, one in red and one in yellow, draw the viewer's eye to a small indented hole found near the top of the work, below which the word "HOLE" appears in black letters on a yellow stripe. The American Dream I (1961) features four circles depicted in two rows of two. Each circle contains stars, along with text, numbers, or a combination of the two, all common elements in Indiana's paintings. Also characteristic is his use of stencils to create text and numbers in bold, vivid colors. Like Jasper Johns's target paintings, Indiana uses repeated simple and familiar geometric shapes to build a striking composition that reads as quickly and easily as a billboard, yet contains layers of symbolism and meaning. As reflected in the title, The Green Diamond Eat/The Red Diamond Die is a 1962 work consisting of two painted diamond-shaped panels intended to be hung side-by-side. In the first, a red circle containing the word "EAT" in green lettering is placed on a green background. The second panel depicts a black circle with the word "DIE" in yellow letters placed on a red background. Robert Indiana's The Demuth American Dream #5 (1963) consists of five square panels displayed in a cross shape. Each panel features a red star, inscribed within black-ringed circle on a gray background. The stars are decorated with the number five, painted in gold and repeated in three sizes that appear to recede into the distance. Each circle is ringed with text, although these stenciled words differ: "DIE" on the top panel, "HUG" on the bottom, "ERR" on the left, and "EAT" on the right. In the central panel we read "AMERICAN DREAM" and the dates "1928" and "1963." Each phrase calls to mind some association, whether it is warm and maternal or dark and reproaching, yet Indiana also used this text to build a web of associations to pay tribute to the American modernist painter, Charles Demuth. The Confederacy: Alabama (1965) is part of Robert Indiana's "Confederacy Series," a group of works depicting the states that seceded from the United States during the Civil War. Typical of many of his works, we see a geometrically based composition, with a series of concentric circles that call to mind a target. At the center, we see a brightly colored outline of the state's silhouette, decorated with a grouping of stars, one of which is labeled "Selma." We also find Indiana using a stenciled text label, "Alabama," at the bottom of the canvas and within the two rings reads the sentence, "Just as in the anatomy of man, every nation must have its hind part." The implication is clear and critical. Perhaps Indiana's best known image, this version of LOVE is a large-scale sculpture, measuring twelve feet high, installed in midtown Manhattan. A simple, bold graphic, the word "LOVE" is stacked in two rows with "L" and "O" placed on top of "V" and "E." The jaunty angle of the "O" creates a playful break from the grid, complimented by the primary colors of paint that cover its surface. The use of red for the exterior facets of the letters and blue for interior spaces create a highly visible and easily legible arrangement. HOPE (2008) is a large-scale steel sculpture, created for the 2008 presidential campaign of Barack Obama, which plays on Indiana's most famous image, LOVE. Featuring the same compositional format of the iconic LOVE sculpture, Indiana stacks the first two letters of the word on top of its last two letters to form four equal parts. In addition to conveying a central message from Obama's campaign (which was also featured in Shepard Fairey's iconic poster), this arrangement (including the same tilted "O") evokes LOVE and binds together these two positive sentiments. 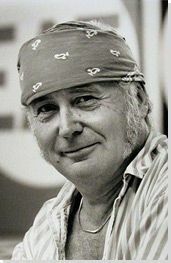 Over the course of his six-decade career, Indiana has often felt compelled to make work with a strong social and political message.